Find lead-free vinyl tubes manufactured by Sioux Chief in the USA. These tubes are suitable for use with beverages, drinking water, acids, alkali, solvents and much more. FDA approved. 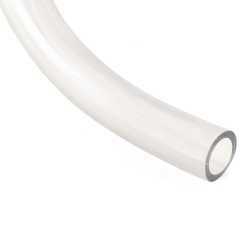 The 900-01103C00101 from Sioux Chief is a 1/4” ID x 3/8” OD Clear Vinyl (PVC) Tubing, 10ft Coil, FDA.. The 900-01153C00101 from Sioux Chief is a 5/16” ID x 7/16” OD Clear Vinyl (PVC) Tubing, 10 ft. Coil,.. The 900-01163C00101 from Sioux Chief is a 3/8” ID x 1/2” OD Clear Vinyl (PVC) Tubing, 10 ft. Coil, F.. The 900-01203C00101 from Sioux Chief is a 1/2” ID x 5/8” OD Clear Vinyl (PVC) Tubing, 10 ft. Coil, F.. The 900-01253C00101 from Sioux Chief is a 5/8” ID x 3/4” OD Clear Vinyl (PVC) Tubing, 10 ft. Coil, F.. The 900-01306C00101 from Sioux Chief is a 3/4” ID x 1” OD Clear Vinyl (PVC) Tubing, 10 ft. Coil, FDA.. The 900-01103C01002 from Sioux Chief is a 1/4” ID x 3/8” OD Clear Vinyl (PVC) Tubing, 100 ft. Coil, .. The 900-01056C01002 from Sioux Chief is a 3/16” ID x 7/16” OD Clear Vinyl (PVC) Tubing, 100 ft. Coil.. The 900-01306C00755 from Sioux Chief is a 3/4” ID x 1” OD Clear Vinyl (PVC) Tubing, 75 ft. Coil, FDA.. The 900-01153C01002 from Sioux Chief is a 5/16” ID x 7/16” OD Clear Vinyl (PVC) Tubing, 100 ft., FDA.. The 900-01163C01001 from Sioux Chief is a 3/8” ID x 1/2” OD Clear Vinyl (PVC) Tubing, 100 ft. Coil, .. Note: Sioux Chief has recently acquired Watts tubing and selec.. The 900-01253C01001 from Sioux Chief is a 5/8” ID x 3/4” OD Clear Vinyl (PVC) Tubing, 100 ft. Coil, ..